In Braveheart, the evil King Longshanks famously mused, "The trouble with Scotland is that it's full of Scots." Brave would like to correct Longshanks - the trouble with Scotland is that it's full of Scots that turn into bears. There are five bears in Brave! So many bears. I'd love to have sat in on the Pixar story conferences when the idea of "the queen mother turns into a bear" was floated and everyone said, "That's it! Let's see where that goes. But we're gonna need more bears." Seemingly an adventure yarn about a plucky, fiery-haired heroine with bow and arrow, Brave turns out to be a story of about a mother and daughter's relationship, where the plucky, fiery-haired* heroine with bow and arrow, Princess Merida (winningly voiced by Kelly MacDonald), must learn to come to an understanding with her overbearing (pun intended) but good-hearted mother (voiced by Emma Thompson). Carefree and prideful Merida chafes under her mother's instructions on how to be a proper lady who will one day become Queen, and rebels outright when the first born sons of the three other clans in Scotland present themselves for her betrothal. (Merida should be glad no mention is made of prima nocte.) After a terrible row with her mother, Merida is lead by will o'the wisps to a witch in the forest, who gives her a spell to "change her mother". Into a bear, it turns out. And this bear thing has happened before; why their Scottish legends turn out to be riddled with tales of rulers who are turned into bears. A good portion of Brave involves Merida and her mother the Queen Bear bonding in the forest as they try to reverse the spell and prevent the clan war threatening to bear down (I had to) upon the realm. In spite of such a strange turn of events, Brave is charming and witty, with heaping physical comedy provided by the king (voiced by Billy Connelly), who lost his own leg to - you guessed it - fighting off a bear. In the end, after the evil bear possessed by the spirit of a dead prince is killed and the queen and the royal triplet sons are all transformed back from bears to human at their Stonehenge, imagine the utter bewilderment of all of the clansmen. They're Highlanders, by God, but that had to be the strangest gathering they've ever had to bear witness to (sorry). 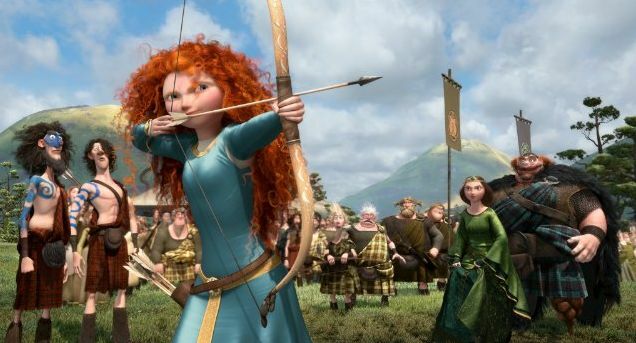 * The animation of Brave is truly gorgeous, especially the textures and rendering of Merida's red hair. Looking at her hair alone is almost worth the price of admission. Smallville: Season 11 #8 - "Guardian"
Smallville: Season 11 #7 - "Guardian"
Game of Thrones 2x10 - "Valar Morghulis"
Smallville: Season 11 #6 - "Guardian"